This style looks great with classic handlooms with wide borders and traditional striped pallu! Lighter fabrics work better for this style as there are many small pleats in the front. It is a modification of the traditional 9 yard sari worn in Maharasthra. With 9 yards you'd just drape the pallu as in the Nivi style over the left shoulder. 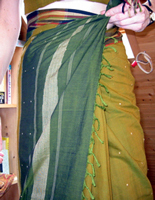 This sari wrap is worn without petticoat, as the sari border will be passed between the legs and tucked in the back waist to form a sort of pants look. You should have between 10 - 15 narrow pleats in front, the center of which is drawn back through the legs and tucked into the rear waist. Wrap the sari starting from your left hip. Wrap towards the right and draw the sari around your waist. Tie the sari onto the waist by taking up a couple inches of border fabric in your left hand at the point where it meets the sari end and tie them together to form a snug waist just under your belly button. Starting from the fabric after the knot on the right side, make a series of about 7 - 10 pleats with your right hand. Draw the pallu around your body again until its end is even with the center of your body. Tuck it in the waist back from hip to hip to hold it in place. 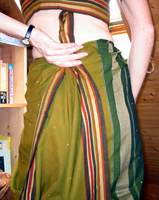 The remaining sari between the pleats and the fabric tucked in at the left hip should be taken up with pleats. The pallu should end at the center of your body, which is where the pleats should fall. Narrower pleats work better for this style. Keep pleating until the fabric is all taken up. Now pick up the pallav edge and line it up with the edge of your pleats. Once you've got the pallu in the right length you can let it fall while you straighten the pleats beneath it. Straighten the pleats and press them flat with your hands. Tuck them in the waist snugly. 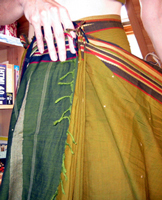 You can fold the pallu into the waist a little higher than the pleats to keep the bottom borders level. Now grasp the bottom border in the center of the pleats and pass it between your legs. This can be tucked into the waistline in back several ways. The first picture of the red sari shows the border being tucked in along the whole back waist to make a very snug pants look. You can also form a knot with the 3 or 4 inches of center lower border and just tuck that into the back. You can use a mirror when you're draping to make sure the legs are evenly draped and that the borders are lined up. If you are tall the calves will be exposed. It is better to wrap this a bit tighter than looser as it is easy to get your feet caught in the other leg when movin and bending! Trust me, I have learned this the hard way! Love these sarees? The red one is an Ilkal sari from Maharastra and the green is a Coimbatore cotton saree from Tamil Nadu. Check out the sarishop for a great selection of these pieces. For sarees with heavy ornamental pallus the ancient Fishtail sari is yet another variation in the huge realm of possibilities that a long piece of unstitched cloth offers to your imagination. Read about how to drape the Fishtail style and the Vijaynagara drape on this informative website.